The final had an average of 690,000 viewers on Saturday night. 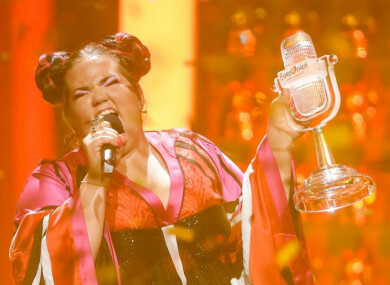 Israel's Netta performs Toy, holding her trophy at the 63rd Eurovision Song Contest. AN AVERAGE OF 690,000 viewers tuned in to watch the Eurovision final on Saturday night. That equates to a 53% share of those watching television in Ireland at the time, RTÉ has said. The peak minute was at 11.09pm – when just over a million viewers tuned in. There were also nearly 70,000 live streams on the RTÉ Player – making the programme one of top five live events on the platform so far this year. Israel’s entry, Toy by Netta, won the competition with a total of 529 points – beating their nearest competitors Cyprus and Austria. Ryan O’Shaughnessy’s performance of Together saw Ireland finish 16th overall (with 136 points). Email “One million viewers tuned in to watch Eurovision ”. Feedback on “One million viewers tuned in to watch Eurovision ”.